Match ratings: How did Hartlepool United's players mark in Bromley victory? Louis Laing and Conor Newton battle for the ball. 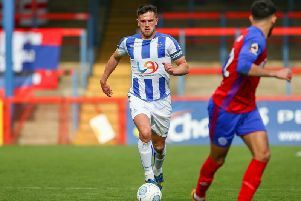 Hartlepool United secured a vital three points as they extended their unbeaten league run to four matches and moved five points clear of the relegation zone. Bromley XI: David Gregory, Josh Rees, Jack Holland, Brandon Hanlan, Adam Mekki, Jordan Higgs (Frankie Sutherland 76), Dan Johnson, Luke Wanadio (George Porter 73), Roger Johnson, Luke Woolfenden, Shane McLoughlin (Tyrone Sterling 86).